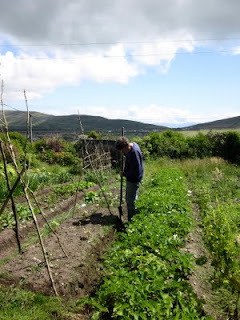 Growing Spuds The Irish way. In some parts of Ireland these are called Lazy Beds. Round here they just call them ridges. First you collect your seaweed, at the start of the year when the Atlantic storms have thrown it up on the beach. Then you spread it on the land and wait for it to rot. Then, when the weather's right and the land's ready, you mark up your ridge with a length of string you've tied between two sticks. And, working backwards, using a spade, you cut a straight line through seaweed and sod along the length of the string, from one end to the other. Then you go to the far end again, and work backwards again, along the same line, cutting and turning sods to form the start of the ridge. The men here work with the minimum of effort, sliding the blade of the spade under the heavy, oblong sods and flipping them over with a turn of the handle; their long-handled spades are perfectly balanced. They move backwards in unbroken rhythm, breathing to the swing of the work. When you finish that stage of the first ridge, you move on to the second, using the string again to keep them straight and parallel. (That's a matter of pride and gets comments from the neighbours.) Each ridge is three foot across. They’re separated by narrow trenches. Digging the trenches provides both the sods that form the sides of the ridges and the earth that’s eventually shoveled over the seed potatoes. 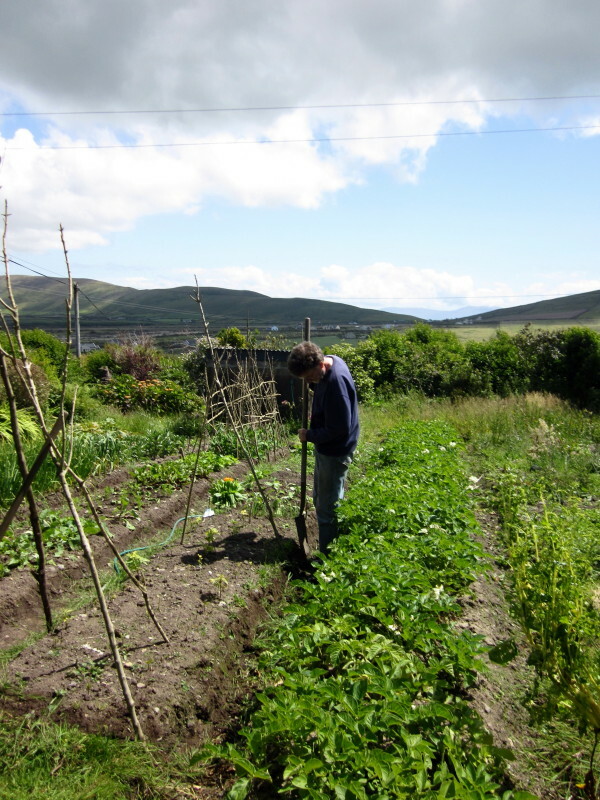 In Ireland, different areas, and sometimes neighbouring parishes, have different ways of setting their potatoes in the ridges. In this village, sods are laid across each ridge, like the rungs of a ladder, and the seed-potatoes are planted between them, in rows of three across. When each ridge is planted it’s covered with earth thrown up from the ditch. Then the earth’s gently beaten flat with the back of a shovel. When the stalks begin to show, you keep the weeds down. When the stalks are the right height you earth them up, throwing shovelfuls of earth in under them and flattening it. Once they bush out enough, no weeds will grow between them. After that it's a matter of shaving weeds from the sloping edges of the ridges with a spade, watering when you need to, spraying if you must, and looking forward to the first crop of the season. We're eating ours every day now. With a lump of yellow butter on each plate and well-chopped chives or scallions. No need for salt if they're grown in seaweed. The sticks you see on the other ridge are lost now under green leaves and red flowers (beans) and green leaves and white flowers (peas). And between them there's beetroot. This is a beautiful account, Felicity. I was able to see a number of people's gardens when I was on Aran over the past two summers, and I'm totally envious (no garden space in my tiny NYC studio apartment). I find the process of using seaweed as fertilizer so fascinating, and just totally brilliant. May your garden be verdant and your spuds plentiful! Glad you like it. You're right, it's brilliant to be able to eat your own produce. (Tonight it's potato cakes flavoured with marjoram. )We really appreciate it when we're in Ireland because, like you in NY, there's no space for us to grow things when we're in London. Hope your book's going well. I'm galloping towards a publisher's deadline in September .. with occasional breaks in the garden and at music sessions in the local pub! "The men here work with the minimum of effort, sliding the blade of the spade under the heavy, oblong sods and flipping them over with a turn of the handle." I picture them in my mind's eye right now - the rhythmic cadence of their motions. Planting spuds is an annual ritual for my Mom. She is in Cork this week working her ridges too. 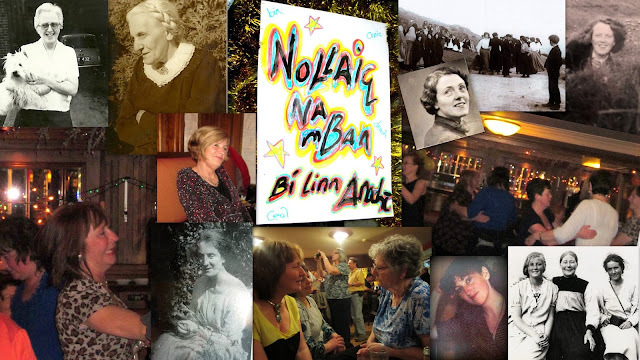 Thanks for this lovely post and for stirring beautiful memories of home for me. Enjoy your garden and the music in the pubs! Thanks, Mairead. It's been a beautiful day in the garden. Inside by the fire now, watching a pink sunset haze roll down the mountain. I'm glad you recognise the rhythmic cadence I was trying to convey in the post. In my book I describe our neighbour Jack teaching us how ridges are made hereabouts, and I say that watching him work is like watching music. I worried afterwards that that might sound poncy. So it's lovely to see you using the same language to describe your own memories.